QS Dyslexia Tests sponsor Dyslexia Awareness Week 2018! Home → News → We’re sponsoring Dyslexia Awareness Week 2018! 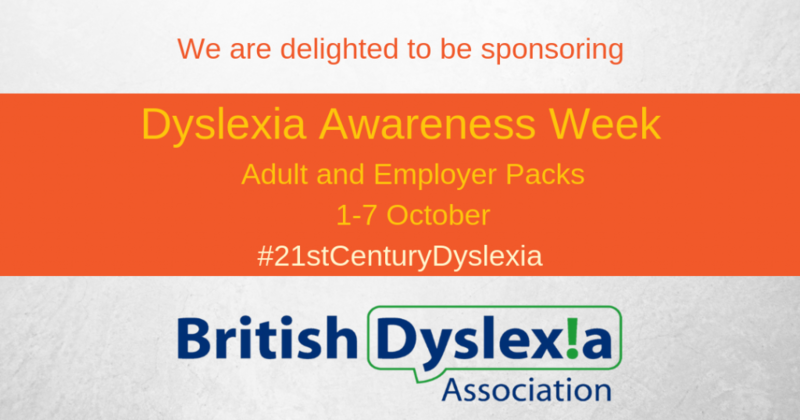 We are delighted to announce that we are the sponsor of the British Dyslexia Association’s Adult and Employer Packs for Dyslexia Awareness Week 2018. 15% of the UK workforce is dyslexic – so supporting your employees enables potential and productivity to be maximised. We are also offering something special for employers, universities and public sector organisations too. If you sign up for a QuickScan or QuickScreen free trial during Dyslexia Awareness Week (1-7 October 2018), your trial of the test(s) and the management portal will be extended to 3 months. Please get your organisation involved in Dyslexia Awareness Week. There are lots of resources and information to help you, as well as free training and webinars throughout the week. In simple terms, being dyslexia friendly makes good business sense! Roughly 9 million people in the UK alone have dyslexia. That’s 15% of the workforce that are employed and 15% of the customers businesses are trying to reach! Supporting your employees improves your business’ productivity and success. Start by downloading the BDA’s Adult and Employer Pack! It costs nothing. Through the work of the British Dyslexia Association and others, awareness of dyslexia has significantly increased. However, the knowledge and understanding around identifying dyslexia; addressing needs and how to develop strategies to overcome challenges still needs improving. I am so delighted to find this page. I have had a long history of dyslexia which runs through my family. It has affected my studies in the past. I posses all the knowledge in Medicine and nursing but never completed my studies. I have since received no support being from an African back ground dyslexia is not address. I would like to attend the dyslexia awareness day on 4th October 2018 with hope that i will find hope as i am fighting to get back on my fit to do something for myself and with the knowledge i receive will be a testimony for me to carry on towards assisting those i can reach out too. Kindly forward to me full details of the event so that i can prepare myself.